Enjoy the Luxury of a ***** hotel and the privacy of your own home! This is a new, architect-designed, detached, substantial, quiet and secure, privately -owned villa on its own grounds (one quarter of an acre) with an integral garage on La Cala Golf course. 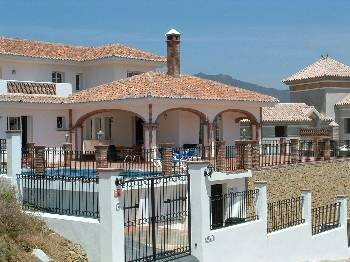 La Cala Golf is a development in the hills overlooking Fuengirola; 10 minutes drive from the coast, on an excellent road, through magnificent scenery. This villa is finished to a high standard of luxury and is in the most prestigious golf and holiday resort of La Cala Golf. It is approximately a 30-minute drive from Malaga airport and a 10-minute drive from the lovely seaside village of La Cala de Mijas and the main beaches, with easy access to all roads and motorways (autovias). The villa is fully furnished with 4 large bedrooms (2 bedrooms each with a 5’ bed; 2 bedrooms each with twin beds). All bedrooms ensuite. There is a guest w.c. etc. off the hall. The south-facing spacious lounge is equipped with satellite T.V. and the diningroom with a large solid teak table and chairs. The solid maple fitted kitchen has black granite worktops and is fully equipped with dishwasher, electric cooker and microwave, central hob, fridgefreezer etc. The adjacent utility room has washing machine and laundry facilities. Top quality cream marble floors in lounge, diningroom, stairways and hall; cream tiled floors elsewhere. Air-conditioned (Summer) heated (Winter) throughout. Heated 9 metre private swimming pool; ample poolside furniture; mobile barbecue. Alarm system; intercom to villa gates, telephone. Uninterrupted views north, south and east overlooking La Cala golf course. Adjacent to the 3rd green and the 4th tee of the south course at La Cala golf. Electric blankets for winter use. Weekly maid service, regular pool and garden maintenance under the management of Mrs. Uta Wenborn & Mr. David Wenborn of Property Management and Maintenance Services. Babysitting can be arranged. Excellent car hire rates and service (you will be met at the airport and guided to the villa – at no extra cost) from LUCAS AUTOS car hire. A car is necessary for full enjoyment of this secure villa. A small car is approximately 120 sterling / 170 euro per week. We recommend LUCAS AUTOS strongly. In addition to providing guidance service to the villa, they also provide a safe and assured mechanism for villa keys etc.